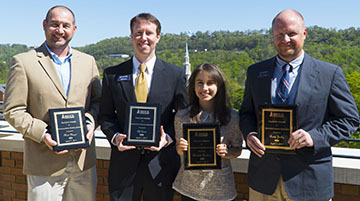 Samford University’s Brock School of Business announced the 2017 Outstanding Faculty Awards at its 53rd annual scholarships and awards ceremony April 4. In addition to recognizing faculty, Brock School of Business awarded undergraduate and graduate student scholarships totaling nearly $140,000. On April 20, scholarships also will be awarded to accounting students during the Beta Alpha Psi banquet. Mary Katherine Stanley, an accounting major from Memphis, Tennessee, received an award for the highest grade point average in the junior class. “We are most appreciative of the endowed scholarship funds as well as the outstanding corporate and individual donations we receive annually. It is through this support that we are able to award scholarships to these deserving students,” said Howard Finch, Brock School of Business dean. Brock School Business faculty also were recognized for their outstanding contributions to the school. These awardees were nominated and chosen by their peers. Michelle Newberry, instructor of accounting, received the award for Excellence in Undergraduate Teaching. The award recognizes a full-time business school faculty member for outstanding achievements, innovation and performance in teaching at the undergraduate level. In her class, Newberry provides a solid foundation for understanding how accounting is the language of business, which is often cited as a critical factor in students ultimately choosing accounting as a major. Students cited her professional demeanor, unfailing encouragement and accessibility as factors that positively influence their education experience. Clif Eason, assistant professor of marketing, received the award for Excellence in Graduate Teaching. The award recognizes a full-time business school faculty member for outstanding achievements, innovation and performance in teaching at the graduate level. Eason was recognized for his significant private-sector work experience, and his extensive network of industry contacts that he fosters to help students learn current and meaningful practices in the field of marketing strategy, as well as for his contributions that enhance the quality of Samford’s M.B.A. curriculum. Matt Mazzei, assistant professor of strategic management, received the award for Outstanding Scholarship. The award recognizes a full-time business school faculty member for outstanding achievements in research and scholarship. Mazzei was invited to present his research at an international conference last fall in Helsinki, Finland. His work has been accepted for publication in prestigious journals, including Business Horizons and Group and Organization Management and Management Decisions. Since joining the faculty in fall 2013, he has published seven peer-reviewed papers in academic journals. His work enhances the reputation of Brock School of Business throughout the academic business community, Finch noted. Rusty Yerkes, assistant professor of finance, received the award for Distinguished Service. The award recognizes a full-time faculty business member for outstanding service rendered to the school, the university, the academic community and the public. Yerkes gives tireless effort in providing opportunities for students to learn to network, as well as gain valuable experience in industry-leading internships, Finch said. He works closely with the student chapter of the Financial Management Association; he has helped create scholarships offered by the Chartered Financial Analysts Association Birmingham chapter; he created a partnership with the Risk and Insurance Management Society of Alabama; and he personally forged the partnership that led to his chaperoning students last fall to the annual meeting of the Berkshire Hathaway Corporation and a personal audience with legendary investor Warren Buffet. Students regularly cite his career counseling and advocacy as major factors in their overall satisfaction with their Brock School of Business experience. He also serves on the Graduate Education Program Committee. Finch added, “Our faculty members are dedicated teachers and scholars who make important contributions to our community, university and economy. We are grateful for their dedicated service to provide quality business education and support for the Christian mission of Samford University."